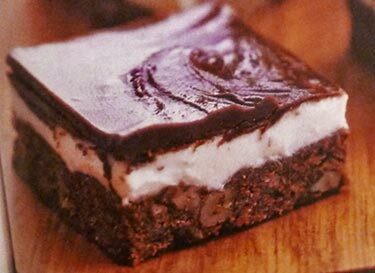 Nanaimo Bars are named after Nanaimo, British Columbia, a small city on Vancouver Island on the west coast of Canada. Ladysmith, British Columbia, is the actual home of nanaimo bars which were created by Mabel Jenkins in the 1950's. The special recipe for these bars was included in a regonial cookbook that was sold in and around the larger city of Nanaimo, and thanks to many tourists to the area, the name Nanaimo Bars caught on and stuck. It's important to note that these bars were initially known as "Mabel Bars" or "W.I. Bars" before their popularity soared, and now may be referred to as no bake chocolate squares or chocolate slices. 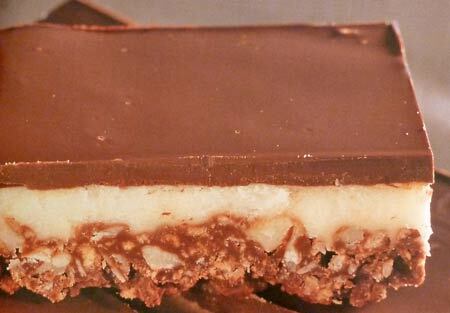 The Nanaimo Bar has since gone on to be voted "Canada's Favorite Confection." These easy cookie bar will need at least 2 hours to chill before serving. Butter and flour an 8-inch square baking pan and set aside. In a 2-quart pan over low heat, melt 6 tablespoons butter then let cool. In a mixing bowl, beat melted butter, 1/4 cup powdered sugar and the egg with an electric mixer on medium speed until well blended. Stir in graham cracker crumbs, coconut, pecans and cocoa powder until thoroughly mixed. Bake about 20 minutes until bars become slightly darker. Meanwhile, in another mixing bowl, beat 1/2 cup butter, remaining 2 cups powdered sugar, the milk and the vanilla with an electric mixer on medium speed until smooth. Spread mixture evenly over cooled crust. In a 2-quart pan over very low heat, stir together the remaining 2 tablespoons butter and the unsweetened chocolate until melted. Spread melted chocolate over filling layer. Cover pan and chill until filling is firm enough to cut neatly, at least 2 hours. This recipe makes about 25 Nanaimo Bars. Lightly grease and line a 11x7-inch baking pan with parchment paper. Using the upper pan of a Double Boiler over almost boiling water, melt 6 tablespoons butter and 4 ounces semisweet dark chocolate, stirring occasionally. Stir in Graham cracker crumbs, coconut and mixed nuts until well mixed. Spoon chocolate mixture into bottom of prepared pan; pressing firmly. Refrigerate pan for 20 minutes. Add the egg yolk and milk in top pan of a double boiler over almost boiling water and beat for 2 to 3 minutes. Beat in 6 tablespoons butter and vanilla until mixture becomes light and fluffy. Gradually beat in confectioners' sugar. Spread filling evenly over chilled chocolate layer and then return pan to refrigerator for 30 more minutes. Melt 4 ounces semisweet dark chocolate and oil in top pan of a double boiler with almost boiling water; stir occasionally until smooth. Cool slightly then pour topping over the filling and tilt pan back and forth to coat evenly. Return pan to refrigerator for about 2 hours, then cut bars into desired size and shape. This recipe makes about 16 Nanaimo Bars.